When it comes to the actual analysis of textual space, we call it fictional space. This narratologically generic term combines functions of all spatial objects. A distinction is made between five spatial entities: settings, projected places, markers, and routes and zones of action(either of settings or projected places). A data model was developed to realise and organise a coherent data basis for the Literary Atlas of Europe. The data basis can be structured into four parts: general text information, including bibliography and assigned model region, data about the author, the temporal structure of the story line, and last but not least the spatial objects. All parts were taken into account within the data scheme shown in an overview in Figure 1. Particular emphasis was put on modelling of the spatial structure of the text – the modelling of spatial objects. You will find the spatial entities that compose the geography of fiction and its complex structure. The geographical information is based on the Simple Features Specification. Settings and projected places with uncertain, transformed or hardly locatable spatial objects necessitate additional attributes and composed geometries respectively in order to reflect the fictional world. This leads to complex attributed spatial data. The data model is implemented within a relational database management system and connected to an online submission form used to receive scholars’ analyses of the data. Moreover, it serves as basis to process the automatically rendered maps for the »Literary Atlas of Europe«. Settings are defined as places of action where the fictional characters are present and acting. The way settings are described within a fiction are quite different from fiction to fiction and have their own, inherent rules. Settings are fragmentary, fictional space is completed and developed through the imagination of the reader. Settings have uncertain, vague boundaries, neither physical nor natural, nor administrative, man-made boundaries. Settings are sometimes difficult to localise and can result in an indeterminate location. The ‘real-world counterpart’ of a setting can lie in any time epoch; the intervening years may have altered the topography. Settings can be transformed or remodelled by the author from the beginning or in the course of the story. The extent of a setting can vary from a room inside a building to an international or worldwide level (theoretically, even galactic expansions such as in most science fiction). The density of settings per text can vary between occasional and accumulated places. Settings are used to create an ambiance or are used as a metaphor; they also have aesthetic functions. 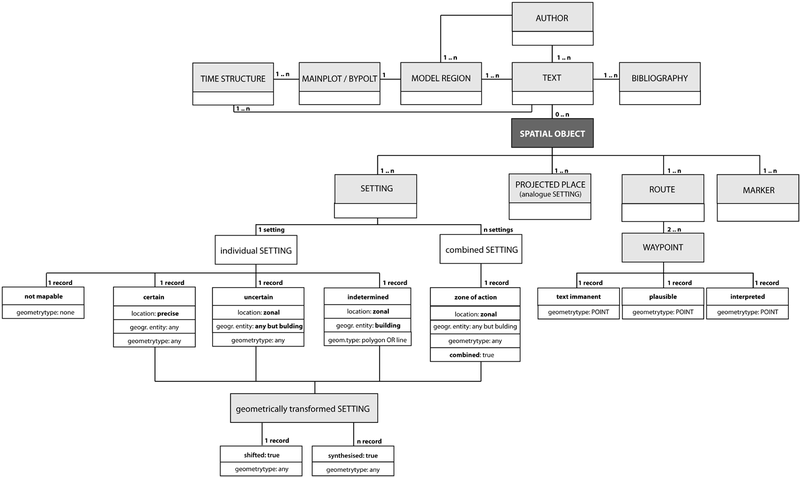 A closer look at the implementation of all properties into the settings data model, one of the main categories that compose the geography of fiction, is presented in Figure 2. We distinguish between combined settings and individual settings. The latter can further categorised as certain, uncertain and undetermined objects. Except in those cases where a setting remains unmappable, all of the objects contain one simple feature geometry and describing attributes. Unmappable settings only contain attributes but cannot be used for a spatial analysis because of the missing geometry. If a geometric transformation has been determined, a secondary geometry can be added as separate object. 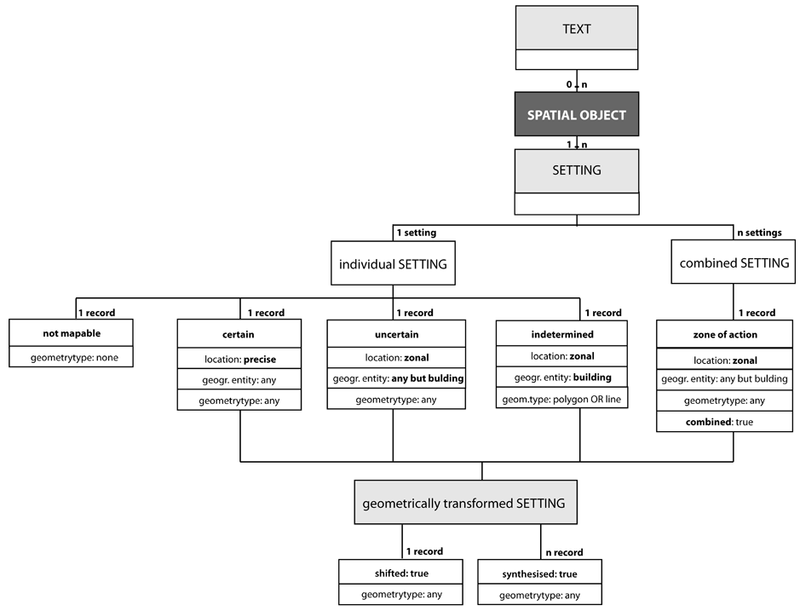 In contrast to usual geodata models, where attribute values are tied to each individual entity, literary attributes of interest are not necessarily connected to the setting object, but rather to the text. This happens if a property – for instance, a mythical connotation – cannot be attached to a particular spatial object, but after reading the whole text, there are nevertheless clear signs of a mythical connotation within the text. In this case, any spatial object inherits the property from the text object.